Home » Knowledge Center » What is “Process Improvement” anyway? Scene: A standard industry networking event. People are gathered, sipping drinks and making awkward conversation with strangers. I am engaged in a conversation with one of said strangers. Stranger: So who are you with and what do you do? Me: I’m the cofounder of Provare Technology. We’re quality and productivity improvement specialists. Me: So I do a lot of process improvement and things like that. That scene occurs at least once at every networking event I attend, and usually multiple times. My job makes so much sense to me, and yet, the reaction I sometimes get when explaining it to others feels like I’m speaking Klingon. 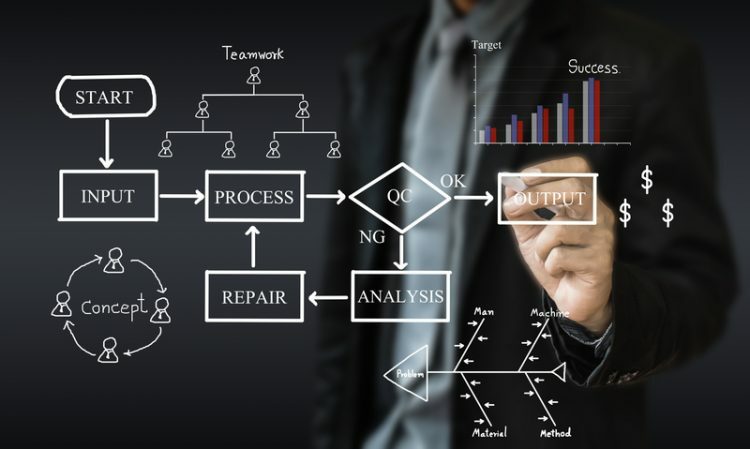 My theory is that, while the basic definition of Process Improvement is easy, there remains considerable confusion as to what it looks like in real life. Process Improvement is all about getting all of the tasks, data, and resources aligned in such a way that the best possible outcome is achieved. It is applicable to every process, regardless of complexity, whether you are assembling milk shakes or jet engines. What improvement looks like is somewhat subjective, but usually defined as a more efficient flow of activities or information. For example, improvements may come in the form of rearranged/reassigned tasks, or better definitions of data to put into a software system. The point is to have a process where everyone knows the who, what, where, when, why, and how, and is able to execute it smoothly. Exactly how does one “make the way to do a thing better”? There’s a process for that! Let me explain what that process looks like for me so that it’s easier to visualize. In the following paragraphs, imagine you’ve hired me to come to your company to do “process improvement”. It starts with knowing what you are doing and how you are doing it currently. That sounds silly at first, but in reality, very few people can actually describe the comprehensive, step-by step tasks, decisions, and data for the things they do at work. However, in order to improve your process, I need to know what you do currently. All of it. How you get notified or triggered to begin the process. All the information you need and what you produce. What actions you take throughout the process. What decisions you make and the resultant actions based on those decisions. Who you interact with on the front- and back-ends and the associated inputs and outputs. How you notify the next person in the process that you are done. Working with the people who perform the process, I will extract that information. And then, I’ll repeat that same “extraction” on everyone else involved in the process. During those conversations, I’m looking for overlaps, inefficiencies, and red flags. I’ll also solicit opinions on improvements from those who perform the process, because they are the real experts on the tasks, not me. At the end of the interviewing process, I can create a visual representation of your process, including the work flow, the data flow, the decisions, the triggers, the resources and roles. This is usually done with a process flow diagram, but I generally also write a narrative for people who process words better than pictures. This results in the often-undervalued “As Is” process map. It is undervalued by some because it takes a fair amount of work to get here and is just telling you what you should already know (but generally don’t). I say that because in every one of the projects I’ve done, the process actors are always shocked at how complex their process looks on paper when you include everything. Every. Single. Time. Once we have the As Is process, the “improvement” part comes in. Because now that we know where we are (As Is) we can figure out how to get to where we want to be (the creatively-named “To Be”). A few more interviews need to take place as the strategic & tactical goals of the team must be taken into account. We will move the interviews up the chain of command to gather the goals, the metrics desired for those goals, the perceived current strengths & weaknesses of the As Is. Using this information and the inputs from the experts on the problems and potential solutions, I can craft the recommended changes to As Is so it can become To Be. One of the more important steps in that endeavor is determining if the desired metrics can actually be tied to tasks that will indicate successful movement toward the goals. Those recommendations are vetted with all of the stakeholders (actors, managers, executives) to ensure everyone is in agreement or to make changes if they are not. Once we’ve all come together on it, I’ll create implementation plans that address the changes needed to forms, systems, tools, training, etc. And we start making those changes, incrementally; testing the metrics to be sure we are getting the results we want along the way. And there you have your first iteration of an improved process. No, they don’t. The end process may be as simple as a checklist that you put together to ensure you’ve done everything in the right order. This is especially useful when it is a set of tasks that you don’t do often. The trick is to simplify without losing essential details. Anything that requires more than 1 step to accomplish. Seriously, though, almost anything you do on a repeated basis is a good target. When it is a process you execute all the time, you are subject to getting in a rut and not thinking of ways it could be better. When it is something you do infrequently, you are subject to wheel reinvention every time because you’ve forgotten how to do it. When it is something you may want to hand-off to someone else, it is very helpful to have a documented process for training. You might be able to do simple, personal process improvements yourself if you have the right mindset for it. However, most of our customers have been shocked at their own blind spots and remark that there was no way they would have pulled all the pieces together on their own. Another thing to consider is “Will you? Really?” If you’re honest with yourself, you’ll realize that the answer is “no, not without an outside force.” Inertia, busyness, not knowing where to start, not having buy-in from other team members are all common blockers to homemade Process Improvement. Here are some of the processes that we’ve developed for our own small company (our size has ranged from 2 to 7 people). These activities are not unique to our business. Most companies do most of them. The surprise is how few have them written down. I’ve also included the form of the “deliverable” for each one. For clients, we’ve mapped and improved sales processes, manufacturing workflows and quality assurance practices, software QA processes, engineering process flows, construction project management workflows. We’ve even mapped and improved the season launch process for a performing arts organization. I know that it can sound easy when it’s laid out like this. But it does take a certain skill-set to be able to pull it off successfully. That second paragraph in the Moving to the “To Be” process section is where the real heavy-lifting occurs; crafting those recommendations takes a combination of mind-set, training, tools, experience, and creativity that not everyone has. And not everyone can work with people who (i) don’t realize what they know, and with (ii) those who think they know everything and then be able to arrive at the truth. The reason I can cross so many different verticals is because I have a lot of experience figuring out how people think, work, and communicate. That is what underlies process improvement. I’ve been given a gift of knowing what questions to ask, how to go deeper, discern the critical issues, and pull it all together so that everyone can see it. But it still takes a lot of work and skills to get it right. That’s probably why this makes so much sense to me while confusing people at Networking Events. P.S. To all of the highly trained Process Improvement gurus out there, this article is not really for you. You already know these things. You know that there are toolboxes full of tools to assist in the process that we execute. You know that there is a plethora of training available to help us be better Process Improvers. This article is for the layperson to get a picture in their minds of what Process Improvement looks like in this “IRL,” from their viewpoint. Hopefully this will help all of us get fewer blank stares at the next networking event! Sandi Tepper is the VP of Technology Services at Provare Technology and is passionately committed to Making the world a better place, one team at a time.